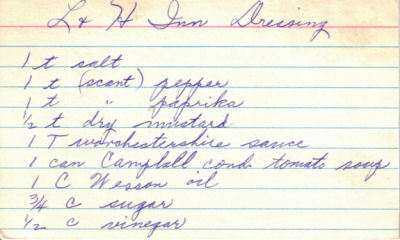 This is a handwritten recipe card from a large collection of old recipes, date unknown. Recipe is typed below along with a scanned copy which you can click to view a large size if you like. Mix ingredients together and shake well. Makes about 2 pts. Fry bacon (cut in bits) and add grease (I do not) and bacon to the dressing. Add bacon to desired amount of dressing to make salad. I have this same recipe, but it calls for chili sauce, not soup. I have also made it with Heinz 57 and it is my favorite that way. From what I heard, the L and H Inn was a restaraunt in South Bend Indiana. This was their house dressing. I was looking for my copy of this recipe but couldn’t find it. The LH (or L&H) Inn was in South Bend. We used to go there for dinner about 50-60 years ago. I don’t remember much about it except it was a roadside restaurant and this was the house dressing. OUr family has made this recipe – with tomato soup – for years. 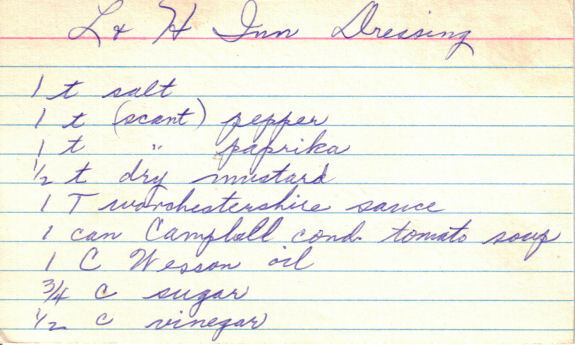 This salad dressing was from the Lincoln Hwy Inn, South Bend, IN. A very popular restaurant in the area in the 60’s – 70’s. The recipe was passed around my family at the time and a favorite of ours. Glad I found it as I lost the copy I had. No, it wasn’t L&H Inn, it was LH Inn, short for Lincoln Highway Inn. And, no, it wasn’t located in South Bend, IN. It was located in Mishawaka, IN.